described as “active light with a pinch of culture”, very quickly became a real hit in our programme of cruises. 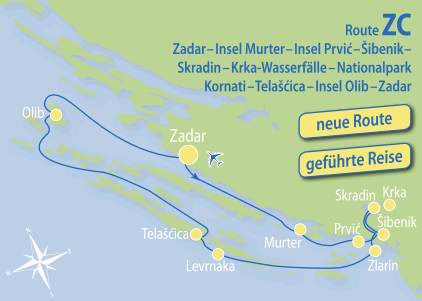 As they have been so successful we have decided as of 2016 also to offer an “Active & Cappuccino” cruise from Zadar. The programme, which is accompanied and led at all times by a tour guide, is aimed at all those who don’t just want to spend their cruise on the sun deck and in the crystal-clear waters of the Adriatic, but don’t want either to be forced to go on daily bike tours of 40 or 50 km or spend hours on hikes. And, of course, there’s enough time left over to sit around or enjoy a relaxed cappuccino. Our “Active & Cappuccino” cruise is also suitable for families with children, as it’s also possible to hire children’s bikes. According to the motto “anything goes but nothing’s compulsory”, you decide for yourself which activities you want to participate in or if you would just like to spend one or more days on the boat. Between 11:30 am and 1:00 pm, embarkation in the port of Zadar, our bikes are waiting for you right in front of the ship. If you are coming by car you can drive into the port from 10:00 am and unload your baggage. Our service team will then direct you to the car park. After embarkation our guide will greet you with a welcome drink, and you will have a chance to get to know the crew and your fellow passengers. After a snack on board we weigh anchor and set out for our first port of call on the island of Vrgada, where we drop anchor to enjoy the crystal-clear waters of the Adriatic Sea for the first time. We then continue our journey to the island of Murter and moor in the Bay of Podvrške. There follows a short bicycle ride across the island – from the village of Betina we head to the village of Murter and back to Podvrške (approx. 8 km). Betina is the centre of traditional wooden shipbuilding. In one of the yards we watch the shipbuilders and caulkers as they go about their work. We will also visit the “training centre for the sustainable development of the islands and the coastal areas”. We then return to the ship for dinner and overnight stay. After breakfast we set a course for the island of Tijat and drop anchor in the Bay of Tijašćica for an extended bathing break. After lunch on board we continue our cruise to the neighbouring island of Prvić and moor in the fishing village of Prvić Šepurine. Then it’s off by bike to the island’s second village, Prvić Luka (approx. 2 km each way). Here we visit the “Faust Vrančić” museum. Faust Vrančić lived in the 16th century and was a diplomat, clergyman, scholar and inventor. He concerned himself, for instance, with the possibility of flood prevention on the River Tiber or supplying Venice with drinking water. Other exhibits relate to sundials, wind, water and tidal mills, a cable car, a chain bridge and a parachute. After returning to Šepurine there is an opportunity to dine out at one of the local konobas, or taverns. Overnight stay in Šepurine. We set sail for the mainland and, after about half an hour, turn into the estuary of the river Krka. Our first destination is Šibenik. Šibenik, mentioned for the first time in 1006, is the youngest of the major cities along the coast but also the oldest Croatian city. This is because it was founded not by Greeks, Romans or Byzantines, but by Croats. The best known building in the old city, reminiscent of a fortress, is the Cathedral of St. Jacob, the most important monument of the Renaissance in Croatia. After a guided tour through the old town we climb up to one of the fortresses situated above the town, which offers a magnificent view over the Krka estuary and the sea to the islands just off the coast. Then we invite you to a cappuccino on the waterfront promenade before we call into one of the bays of the Prokljansko Jezero – where the Krka widens out to form a lake – to take lunch on board and enjoy a refreshing dip. The cruise continues to Skradin, shortly before the famous Krka waterfalls. There follows a walk through the village and opportunity to climb up to the fortress of Turina. During the walk we visit the museum, where items of glassware which bear witness to life in ancient Scardona in the 1st to 3rd centuries are on show alongside ancient stone monuments. There follows an opportunity to dine in Skradin. Overnight stay in Skradin. After breakfast we cycle along the Krka to the “Skradinski Buk” (5 km each way), which is the most famous part of the National Park of the Krka waterfalls where, over a distance of 800 m, the Krka plunges 46 m over 17 waterfalls with cascades of up to 100 m in width. You shouldn’t forget your swimsuit, because a dip in the crystal-clear waters of the Krka right beneath the waterfalls is a unique experience. After returning and taking lunch on board, we weigh anchor and head once again for the Adriatic coast. Our next port of call is the former naval port at Šibenik, from where we walk to the fortified islet of Sveti Nikola. After visiting the fortress, we head for the island of Zlarin. After a break for swimming in one of the bays, we moor in the harbour of the fishing village of Zlarin. It’s no accident that Zlarin is known as the “Coral Island”, as the residents have engaged in coral diving for centuries. We then visit the Coral Museum with its coral jewellery workshop and get to see how coral is worked. There follows an opportunity to dine at one of the restaurants. Overnight stay in the port of Zlarin. “On the last day of creation, God desired to crown his work and thus created the Kornati Islands out of tears, stars and breath,” wrote the Irish writer George Bernard Shaw (who was awarded the Nobel Prize for literature in 1925). The glories of the natural environment, the numerous small and large islands (as the vernacular has it, “for every day of the year there’s an island”), the wonderful sea – all this makes the Kornati Islands a unique paradise. They form the largest and densest collection of islands in the Adriatic Sea, including 147 islands, islets and reefs with a total surface area of 69 km 2 , scattered over 230 km 2 . 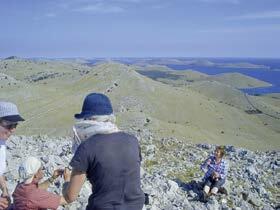 They extend over a length of about 35 km and a width of 13 km between the islands of Dugi Otok to the northwest, Žirje to the south-east and Pašman, Vrgada and Murter to the north and the north-east. Today we leave Zlarin and cruise the entire length of the National Park. We moor on the island of Levrnaka to take a walk across the island. There follows lunch on board and plenty of time for swimming before we leave the National Park at the north-western end and enter the Telašćica nature park. Telašćica is a bay which forms a roughly 8-km-deep indentation in the south-east of the island of Dugi Otok. From the mooring we take a walk to Lake “Mir” (peace) and up the breathtaking cliffs which tower up here to 161 m above sea level. And don’t be surprised if you encounter the odd donkey here that comes right up close to the ship. For it is here that about 15 donkeys which are no longer needed for agricultural purposes on the island have found their new home and now live in the wild. In this wonderful environment the captain’s dinner, which is served this evening, will taste even better. After breakfast we leave the park and head north-west along the west coast of the island of Dugi Otok. After a voyage of about three hours we drop anchor in the beautiful Bay of Sakarun with its turquoise waters, the likes of which are seldom seen in the Adriatic. There follows an extended swimming break and lunch on board before the cruise continues. We pass the lighthouse of Veli Rat, which, at 42 m, is not only the highest lighthouse in Croatia but is also considered one of the most beautiful. The yellowish colour of the facade, by the way, is derived from about 100,000 egg yolks that were mixed in with the exterior plaster in 1849 to make it more resistant to sea salt. Our destination is the island of Olib. There follows an opportunity to dine at one of the restaurants on Olib. Overnight stay on Olib. In the event of adverse wind conditions (Bora) we will head for the one of the islands of Ist or Molat instead of the island of Olib. The island of Olib, together with Silba and Premuda and several smaller uninhabited islets, forms an archipelago on the border between Dalmatia and the Kvarner Gulf which belongs officially to the city of Zadar. Olib has only about 150 permanent residents, who mainly earn their living from olivegrowing and a little agriculture. In recent years, the islanders have returned to some traditional ways, including the ancestral extraction of sea salt without salt works and the use of seaweed to make cushions and mattresses. There follows a short bike tour (about 7 km) or a hike across the island. 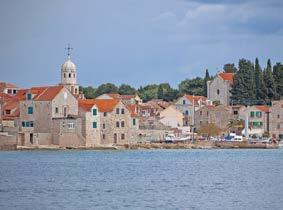 We visit the local olive oil mill and the “Kaštel” fortified tower, built in the 16th century as protection from pirates, and are introduced to the extraction of sea salt, including a small sample of the salt. We leave Olib and resume our course for Zadar. There follows lunch on board during the cruise, after which we will enjoy the last bathing break before running into the port of Zadar, where our tour guide will be waiting to take you on a guided tour of the old town surrounded by mighty walls. 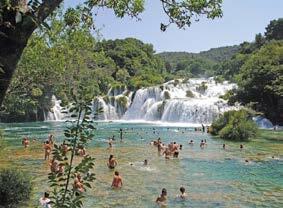 Opportunity to dine in one of the numerous restaurants and overnight stay in Zadar.